Want to add free game to your iPad, iPod and iPhone device game list? The Big Time Gangsta game from Glu is a worthwhile addition then. Big Time Gangsta is an rich 3D graphics and interactive game, which the gamer attempt to become the strongest thug in the streets of Mission Hill for survival. In this game, the gamers need to build their gang from the bunch of street soldiers, ex-cons and wanted crooks roaming the blocks. Crazy 3D shootouts and battles – Equip gang with deadly weapons and get right into in the action as only one side can survive a deadly shoot out. Own the entire city – Take over the whole city, building by building, block by block and street by street. Baddest gangstas on the planet – Choose from 7 of the most insane gangstas to form big time gang. Arsenal of deadly firarms – Arm gang with some of the most lethal weapons on the streets, from handguns and magnums to powerful machine guns. Game center achievements – Being big time doesn’t mean anything if your rivals are even bigger. 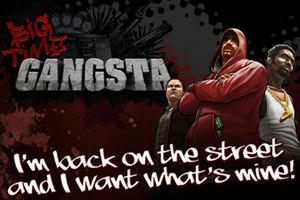 Show them who’s boss by earning gangsta achievements. The Big Time Gangsta game is available as a free download for anyone who ages at least 17 years old from App store. This free game works well in iPhone, iPad and iPod with iOS 3.0 and above.